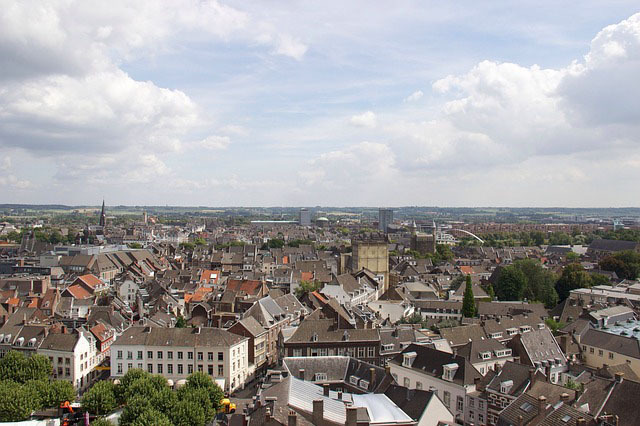 Maastricht is surely known as one of Europe’s most sought after tourist destinations, but this summer it also became a meeting point for archaeologists from Europe and beyond. The occasion was the annual conference of the European Association of Archaeologists (EAA), an event that happens every summer in a different city. The principal aim of the EAA and its conference is to further collaboration an exchange within European archaeology. In that spirit, three members of DEEPDEAD (Estella Weiss-Krejci, Ladislav Smejda and myself) organised a session in Maastricht a) to present some key findings of the project and b) to bring together a number of scholars working on topics similar or related to DEEPDEAD. Titled ‘Deploying the Dead: interdisciplinary dialogues’, it took place on the morning of Saturday, 4 September. As a whole, the 12 papers in the session addressed three broad themes. One group of presentations focused on the ways in which cultural conceptions of the long-dead may influence, and, be at odds with, archaeological research. A key example here, addressed in Philip Schwyzer’s (DEEPDEAD; University of Exeter) and Jo Appleby’s (University of Leicester) papers was the recent exhumation of the remains of Richard III in Leicester. 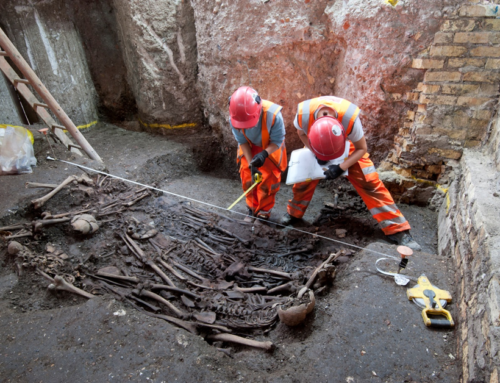 In this case, Shakespearean and other cultural notions of death, largely popularised by the mass media, provided a distinctive filter through which the public perceived the archaeological research carried out on this long-dead individual. That cultural perspective, however, was not easily accommodated within existing frameworks of archaeological practice. Thus both presentations highlighted the capacity of long-dead bodies to invoke different and often conflicting interpretations of the past. Another key theme of the session addressed a rather similar concern. A couple of papers looked at how archaeological discourse on long-dead bodies may be used for didactic and broader social initiatives. Lindsey Büster (University of Bradford) shared some interesting findings of the Continuing Bonds Project in the UK. Based on the cooperation between healthcare professionals and archaeologists, the project uses archaeological discourses on death to inform and improve existing palliative care. This may take the form of informal gatherings at which archaeologists and medical patients talk about death. Through such open dialogues contemporary conceptions of mortality may be improved in ways that are beneficial both to individual patients and society at large. Joanna Debowska-Ludwin (Jagiellonian University in Krakow) introduced a similar approach in the context of schools. She and her colleagues had organised workshops for children of different ages, allowing them to experience the work of archaeologists first hand. This included the ‘excavation’ of a mock Egyptian grave and its subsequent recording. Again, the potential of archaeology to inform and perhaps even improve contemporary perceptions of mortality and death stood out as a key issue. The third key theme focused more specifically on the role of archaeology and material culture studies in the interpretation of long-dead bodies. Here all contributions came from members of DEEPDEAD and doubtlessly highlighted the interdisciplinary framework of the project. At one end of the spectrum were comprehensive analyses of archaeological and historical contexts. Ladislav Smejda (Czech University of Life Sciences Prague) provided a thought-provoking account of cannibalism, suggesting that this particular form of engagement with dead bodies is a phenomenon not only well-attested in historical sources, but also in archaeological contexts. The ubiquity of the practice indicates that it is not merely an ‘exotic’ phenomenon, but indeed situated within broader socio-historical processes. Focusing on a particular site in the Czech Republic (Kutná Hora), Jan Horak (Czech University of Life Sciences, Dept. of Ecology; Charles University, Institute of Archaeology) introduced us to some of the fascinating ways in which contemporary archaeological analyses can shed light on the often minute and complex modifications of dead bodies during and after funerary rituals. The agency of material culture associated with the long-dead was an issue common to two papers, focusing on medieval and post-medieval Europe. Estella Weiss-Krejci (Austrian Academy of Sciences) presented the results of her ongoing research on different types of amulets. These ornaments may have the shape of a particular saintly body part or of the weapon by which a martyr was killed. By wearing such amulets on the body, a person could access the power of long-dead saints, thus warding off evil and disease. Naomi Howell (University of Exeter) discussed the curious case of the heart-case of Abbot Roger de Norton. This Medieval relic was found under the paving of St Albans Abbey, but features of its design suggest complex interrelations with the Islamic world. In fact, these seem to lie at the heart of the construction and expansion of the Abbey and Church of St Albans itself, highlighting the potentiality of relics to epitomise complex sets of relationships. My paper focused less on specific case studies and was more concerned with a number of diachronic patterns in the relationship between long-dead bodies and later societies. To do that I drew on methods borrowed from corpus linguistic studies. My research uses digitised archives of archaeological literature to distil patterns that may have gone unnoticed so far. For that purpose I use software that is normally employed in linguistic analyses to query for keywords that tell us something about the role of dead bodies in the past. That process is still very much at an experimental stage, but the map below gives you an idea of what is already possible. 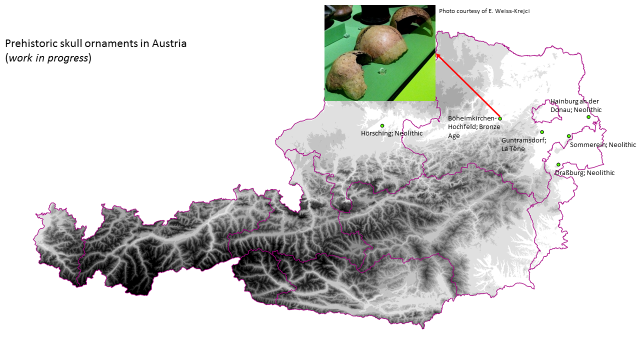 It shows the distribution of prehistoric human skull amulets in Austria (again, this is work in process, so the map may not, as yet, show all relevant find spots). This is the result of having processed more than 50 volumes of archaeological find reports with a corpus linguistic software. The find spots were then extracted, georeferenced and mapped. What does this tell us? At this stage, I am still in the process of tuning the software to make it a useful tool for archaeological questions, but at the very least it provides a very efficient way of gaining a basic overview over distinctive phenomena – such as the distribution of amulets fashioned out of human skulls. In the future it should be possible to synthesise various phenomena relating to the use of long-dead bodies into a more comprehensive account. Was our session a success? Notwithstanding my probably biased perception, I think it was. In spite of a cold and overcast morning, the session was well attended and enlivened by stimulating discussions (and sufficient coffee breaks!). It was encouraging to see that the issues addressed by DEEPDEAD seem to be of relevance to many of my colleagues in archaeology. However, perhaps the most significant contribution of our session to the conference as a whole was epistemological. Why does archaeology actually matter in contemporary society? What makes it a socially relevant discipline? In that respect, the papers in our session highlighted one issue in particular: the great potential of archaeology to say something about the relationship between the long-dead and the living, if not, more generally, between the past and the present. This blog entry is the first in a series that will deliver further reflections on our DEEPDEAD session in Maastricht. So stay tuned and watch this space.